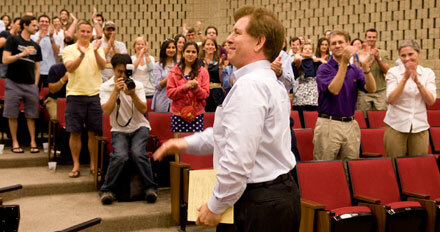 Hailed by students as a true role model, a thought leader and someone who encouraged them to dig more deeply, Professor David Besanko (above) on June 4 was named the 2010 L.G. Lavengood Outstanding Professor of the Year. Besanko, the Alvin J. Huss Professor of Management and Strategy, said he was particularly moved by the honor, as he had been a student and then a colleague of Professor Lawrence G. Lavengood, the legendary professor for whom the award is named. 'As a Kellogg professor, I have the best job in the world because I can teach extraordinarily interesting material, work with brilliant colleagues and most of all, get an opportunity to teach you all,' Besanko told the students, who gave him a standing ovation. This is the second Lavengood award for Besanko, who was first honored with the award in 1995. A faculty member at Kellogg since 1991, he teaches courses in microeconomics and competitive strategy and has served as a senior associate dean for academic affairs. Besanko earned his master's and doctoral degrees at Kellogg in 1980 and 1982, respectively. Students in the graduating Executive MBA classes also honored top professors this year. Tim Calkins, clinical professor of marketing, was voted top professor for core academic classes by EMP-77, and Steve Rogers, the Gordon and Llura Gund Family Professor of Entrepreneurship, received the honor for elective courses. EMP-78 named Janice Eberly, the John L. and Helen Kellogg Professor of Finance, top professor for core academic classes while Sergio Rebelo, the Tokai Bank Professor of International Finance, took honors for the elective courses.